Appointment C’ttee Chairman Defending Nominees? The chairman of the appointments committee vetting the president's ministerial nominees, First Deputy Speaker Freddy Blay, has been criticized by some committee members for his interruptions when members ask questions he perceives unfavorable to the nominees. However, Dr. Ben Kumbuor, a member of the committee, says the conduct of the chairman will not affect the outcome of the vetting process. Some minority members have had course to complain about Blay's conduct in open sitting. 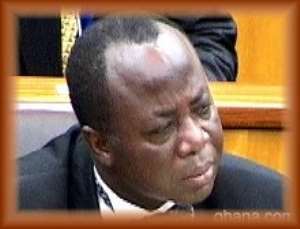 On Wednesday Kumbuor, NDC MP for Lawra Nandom, objected to the ruling by the chairman preventing the nominee for the Trade and Industry position, Allan Kyeremanten, from answering a question posed to him. Speaking to a local radio station, JoyFM, Dr. Kumbuor said members of the committee members are independent minded and will not allow the demeanor of the chairman to influence their decision when the report of the exercise is been compiled. Dr Kumbuor said normally when such issues come up, there should be ways of consulting with other members of the committee for a decision to be taken, but when one is cut off from or prevented from asking question, there is bound to be disagreement. “I have learnt to work with him and he has always been like that anyway and so those of us who insist that we must do what we think is right, we do it and work together,” Dr Kumbuor said Bagbin Concerned About Public Outcry On His Questioning Minority Leader in Parliament, Alban Bagbin has expressed concern about public lack of appreciation of the vetting process. Mr Bagbin a member of the Appointment Committee was responding to comments from sections of the public that some minority members on the committee only seek to frustrate the minister-designate. Such comments, according to the minority leader tend to affect the performance of the committee members who are already faced with some constraints like limited time within which they have to assess the nominees. Mr Bagbin referred to the vetting process in 2001 during which the minority members raised issues with some of the president's nominations but were ignored. He said later events vindicated the minority stance. “Those nominees that we raised issues actually came out clearly that they were not suitable for those positions, while unfortunately some of them have been nominated again by his excellency for those positions”, he said.